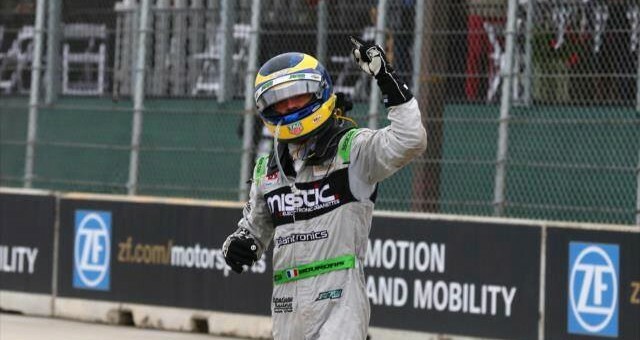 This past Sunday, KV Racing Technology’s Sebastien Bourdais drove to his first win of 2015, and it was at one of the most difficult tracks on the calendar, Belle Isle. The Detroit GP track is tight, bumpy and lined with cement barriers, and Bourdais wouldn’t have it any other way. Bourdais, who formerly raced in F1 with Red Bull’s driver development team Toro Rosso, told USA Today that the temporary 2.35-mile track at Detroit is tougher than any circuit F1 races on. That includes the equally as tight and daunting circuit at Monaco, too. Monaco hasn’t changed since Bourdais raced there, however many F1 tracks now have lots of run off and are filled with technical corners to make passing easier. F1 cars are now faster than ever, but the wide, technical tracks don’t make it look that way. However when IndyCar races on a street circuit like Belle Isle, things look impossibly fast. Just have a look at this onboard from Simon Pagenaud at St. Petersburg in 2014. Apart from the tracks, Bourdais thinks the racing is better in IndyCar as well. Indy has had seven different winners in eight different races this year and the racing is action-packed and filled with uncertainty. In F1, meanwhile, Mercedes-Benz is dominating the grid, just as they did last year and just as Red Bull did the four years before that. “In IndyCar, no one makes money. It’s just great, pure racing,” he added. He absolutely right, it is boring to watch the F1 race.